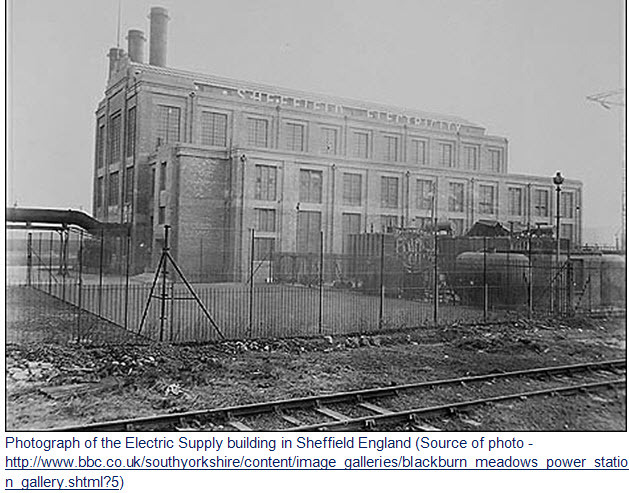 Ernest Pasley was born on September 12, 1889 at Sheffield England and was the son of William and Sara Ann Pasley. As with most young men, he sought adventure and opportunity to travel. At the age of 16, he joined the Royal Navy and served on many ships: HMS Ganges, HMS Hoyne, HMS Vivid, HMS Hannibal and HMS New Zealand. 1908 – 30 days in cells. Once out of the Royal Navy, Ernest secured a position as a fireman with the Electric Supply Department in Sheffield, England and worked there for the next three years. Despite having a secure job and being close to his family, Ernest decided to immigrate to Canada in 1911. 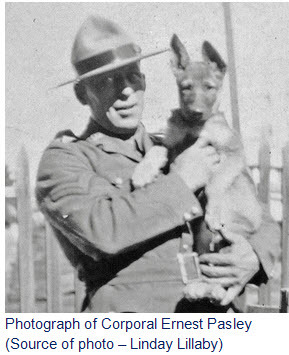 After working two years at a variety of jobs in Canada, he applied and was accepted into the Royal North-West Mounted Police on August 9, 1913. Upon being engaged into the Force, Ernest was assigned the regimental number of 5720. As with all new members of the Force, he undertook his basic training at ‘Depot’ Division in Regina. Two years before Ernest Pasley joined the Force, two white hunters were killed by their Inuit guides near Bathurst Inlet. The two white hunters were one American hunter named Harry Radford and a young Canadian surveyor named George Street. An Inuit native, from Bathurst Inlet, traveled across the Arctic tundra to the Hudson’s Bay Company trading post at Chesterfield Inlet and recounted the story of the murders to the Hudson’s Bay officer. 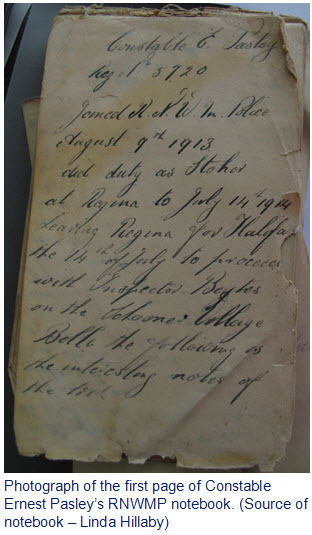 With these details of the noted murders, the Hudson’s Bay officer reported the information to the RNWMP members stationed at Fort Churchill because the nearby Fullerton RNWMP Post has been temporarily closed. Upon receipt of the news, the members at Fort Churchill reported the details to the RNWMP headquarters in Regina. Upon receiving the information, Superintendent Cortlandt Starnes was tasked to assess the situation and develop a plan to investigate these murders. Supt. Moodie had experienced many difficulties in acquiring and directing supply ships to support the needs of these two posts on the Hudson’s Bay. Consequently, he repeatedly recommended to the Commissioner that the Force have a dedicated schooner that could be devoted to supplying and supporting these RNWMP posts on the Hudson’s Bay. Each of these requests had been rejected by the Force’s Comptroller. From this post, the expedition would travel overland to Bathurst Inlet to conduct their investigation and locate the individuals responsible for these murders. 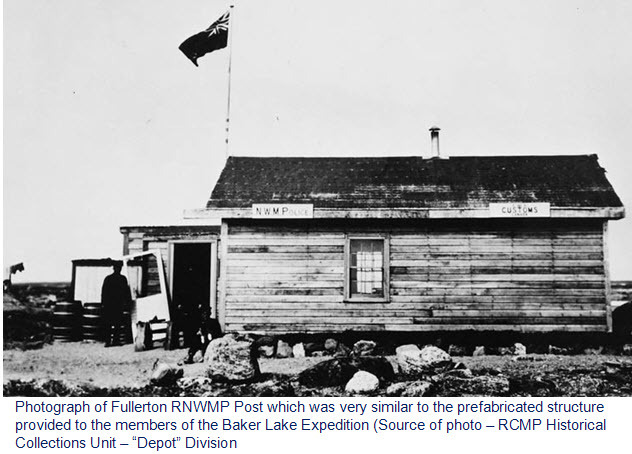 In proceeding with this expedition, the RNWMP Comptroller approved the purchase of a schooner to transport the men, supplies and equipment to Bake Lake. For the schooner, the Canadian government purchased a Lunenburg built 99 ton topsail schooner called the “Village Belle.” Captain Lockhart was assigned the responsibility of operating the schooner. Inspector Walter James Beyts was appointed to head the Baker Lake Expedition. He had risen from the ranks and was promoted to Inspector on January 30,1911. Beyts had many years of experience in the north having been posted to the Peace River and Dawson areas. In addition, he served in the Canadian Mounted Rifles during the Boer War. After the announcement of this expedition, several Ontario newspaper reports suggested that this expedition was a punitive assignment for Inspector Beyts. However, the Force Comptroller responded by denying this suggestion in several Ontario newspapers. 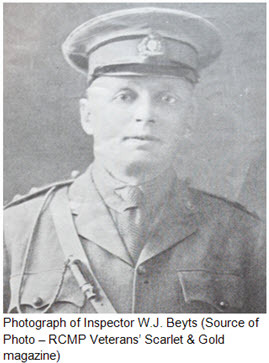 To support Beyts, Sergeant Major Thomas Caulkin was transferred to the expedition. He volunteered for this expedition when he was stationed at Maple Creek. At the time, Thomas Caulkin was described as a member who ‘showed some promise’ having only been in the Force for seven years and had been promoted quickly through the ranks. 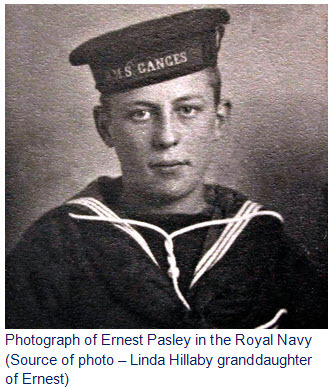 Constable Ernest Pasley who also had considerable Royal Navy experience. Between the time that Ernest Pasley finished his “Depot” basic training and departing on the expedition, he was delegated to be a ‘stoker’ of the coal furnaces at “Depot” Division. Lashed down on her deck were the makings of a small pre-fabricated wooden building which would serve as their shelter for the next two years. At the commencement of this expedition, Constable Ernest Pasley frequently recorded his duties and observations in his RNWMP notebook. His initial entries were in ink but quickly changed to pencil as the temperatures dropped below zero. This notebook has survived and has been passed down to his granddaughter – Linda Hillaby. the details contained within Ernest Pasley’s notebook. On July 30, 1914, the expedition departed Halifax. Owing to unusually bad weather and problems with their new schooner, the expedition did not reach the Chesterfield Inlet until late September 1914. As such, there were unable to establish a Detachment at Baker Lake. With weather closing in and the Hudson’s Bay freezing up in December, Inspector Beyts felt that it would be most appropriate to construct a temporary post at Chesterfield Inlet settlement and be in close proximity to the Hudson’s Bay Company post and the Roman Catholic missionary. It was Beyts’ plan to move the expedition with their building and supplies to Baker Lake in the summer of 1915. “I would like to remark further with regard to the portable detachment building, although I have referred to this before in my reports previously rendered, I feel I cannot permit my report to go without making a few remarks relative to the unsuitability of portable dwellings for this northern country. After unloading the supplies and equipment for the Baker Lake Patrol, Captain Lockhart headed 500 miles south to Port Nelson to prepare the ship for the forthcoming freeze up of the entire Hudson’s Bay. At the Fullerton settlement, the expeditionary members acquired four teams of dogs with eight dogs in each team. It would be these sleds and dogs that would provide them with transportation during the winter months. On January 1915, Insp. 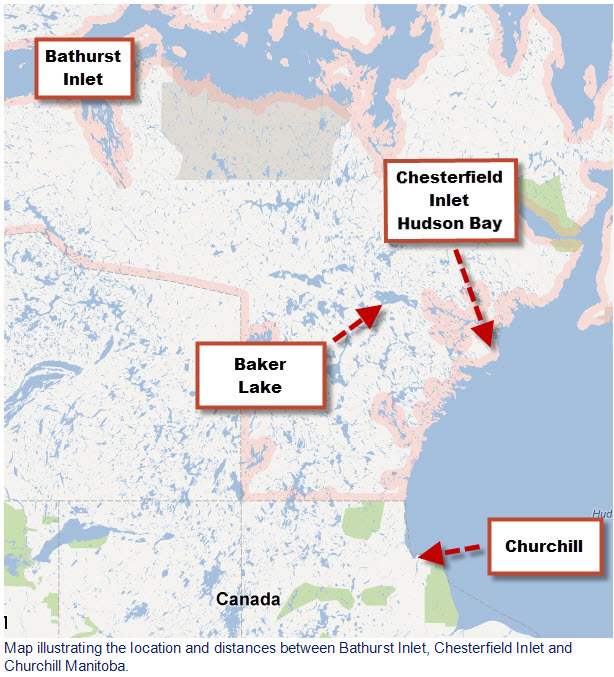 Beyts set out to Fort Churchill to send his reports to the Commissioner on the conditions at Chesterfield Inlet and outline his plans for the forthcoming year. In addition, he needed to meet with Captain Lockhart, at Fort Nelson, to discuss how the schooner “Village Belle” would be needed to assist them in the summer of 1915. 900 pounds of supplies (30 days of rations for the men and 12 days ration for the dogs). Beyts’ patrol averaged 20 to 30 miles. At the end of each day, the two guides would construct an igloo for the night and Ernest Pasley would feed the dogs before settling down for the night. On many days during this journey south, Constable Pasley recorded their activities and achievements. The following image is a typical entry that Constable Pasley made in his notebook. The below-zero weather, the heavy sledding and the lack of game en route placed havoc with their dogs. One dog was killed because it went mad and four other dogs were killed because of starvation. On January 27, 1915 with temperature 48 below, Constable Pasley and the two guides were harnessed up to help pull the sled. They continued this pulling until they reached Fort Churchill on February 16, 1915. “We had a hard trip down owing to deep snow while on land, and the rough ice whilst travelling on the sea, and I must say Constable Pasley and the two natives worked hard on the trip, as they were in harness for a good many days helping the dogs out. Upon arriving at Fort Churchill, Constable Pasley was suffering from snow blindness so he remained there to recover along with both guides. Beyts secured a new 7 dog team and the assistance of Corporal Edward J. Cronk (Reg. #5136), of Fort Churchill Post. They then pushed onto Fort Nelson to meet up with Captain Lockhart. After their meeting, Insp. Beyts returned to Chesterfield Inlet on dog sled completing the round trip journey of 1,333 miles in 56.5 days. While Beyts and Pasley were away, Thomas Caulkin patrolled to east of the Chesterfield Inlet and was able to obtain statements from Inuit individuals who corroborated the original report that Radford and Street had been murdered. 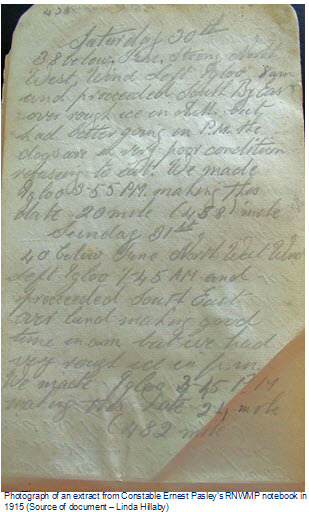 During the summer of 1915, the team waited patiently for the schooner to arrive with fresh supplies and help to establish the Baker Lake Post. Storms and accidents delayed the ship’s arrival. 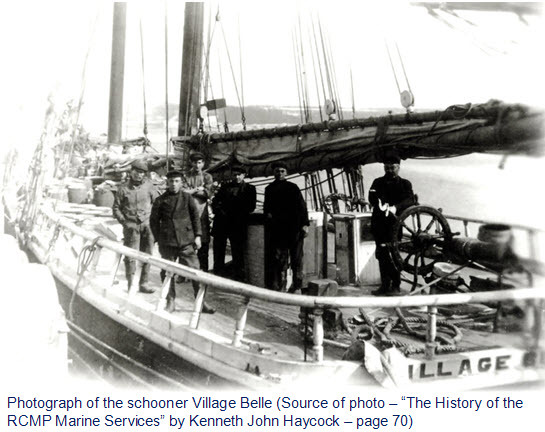 On August 19, 1915, the schooner “Village Belle” returned to Chesterfield Inlet and all the supplies were loaded. The schooner reached Baker Lake on September 9, 1915. Due to mechanical problems with the schooner and high winds on the lake, the captain felt it was unsafe to make it to the west side of Baker Lake. As such, Inspector Beyts decided to establish their post at the east shore of Baker Lake. Once the schooner was unloaded, it returned to Fort Nelson to prepare for the freeze up of the Hudson’s Bay. Insp. Beyts pushed forward with plans to establish supply depots on route to Bathurst Inlet. However, the expeditionary team were plagued with problems: small engine in their small boat failed; tiller on a second boat broke; two oars were smashed; the boat hook went overboard; tent caught fire; and lantern broke. Despite these problems, they were able to establish a supply depot only forty miles west of their Baker Lake post. This achievement was made in spite of the bitter cold, incessant storms, lack of game, scarcity of timber and fuel. Of the twenty-four sled dogs they had set out with, six had died of starvation. On October 10, 1915, Constable Ernest Pasley arrived from Fort Churchill aboard the Hudson’s Bay coast boat bringing 11.5 tons of coal. For the fall of 1915, the expeditionary team spent most of their time setting up and organizing their new post. In the winter of 1915-1916, an advanced camp had been established at Thelon River. In reading Insp. 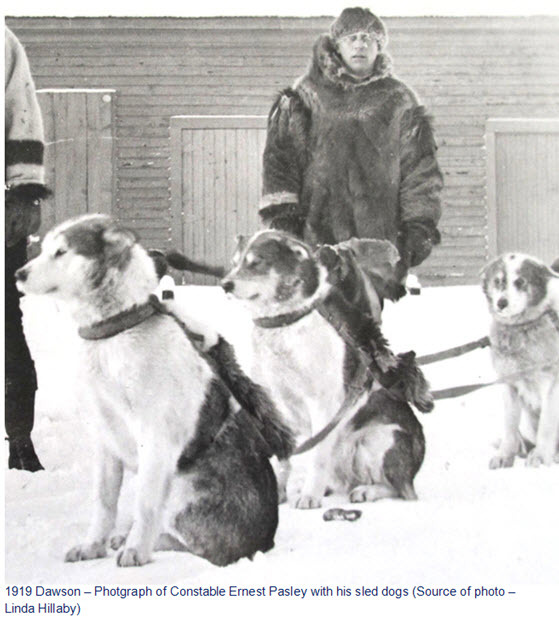 Beyts’ reports on the conditions at Baker Lake, the Commissioner acknowledged the exhaustion of the sled dogs but also recognized the exhaustion of Insp. Beyts. As such, he ordered Inspector Frank French to travel to Baker Lake to take command of the expedition. July 1916 – Photograph of Akular, Cpl. Conway, Cst. Kennedy, Cst. Pasley and Joe. Insp. Beyts and S/M Caulkin taken at Baker Lake. (Source of photo – Library Archives of Canada – Ref.#:RG18 Vol. 2160, 20-28). French arrived on September 9, 1916 on board the coastal boat “Nacopie” which was delivering coal to the Chesterfield Inlet settlement. He found Beyts exhausted and weak. On presentation of the Commissioner’s transfer orders to Insp. Beyts, Insp. French took command of the expedition. These orders also required Insp. Beyts and Constable Pasley to return on the waiting coastal ship to begin their travels back to Regina. Sergeant Major Thomas Caulkin would remain with the expedition and had learned to speak the native language. On September 20, 1916, Beyts and Pasley were met at Fort Churchill by Superintendent John Moodie. Moodie led the group back to Regina by travelling down the Nelson River to portage to The Pas then continue westward to Prince Albert then land transportation to Regina. July 10, 1916 – Disobedience – Fined $10. None of the other members on the expedition received the same level of special treatment from Inspector Beyts. On August 8, 1917, Constable Pasley was discharged from the Force as “Term Expired.” Then six days later, he was accepted in the Canadian Naval Volunteer Reserve as a Ordinary Seaman and later served on: HMCS Niobe, HMS Vivid, HMS and HMS Emperor of India. After completing, two years in the Naval Reserve, he re-engaged in the Force on April 23, 1919. 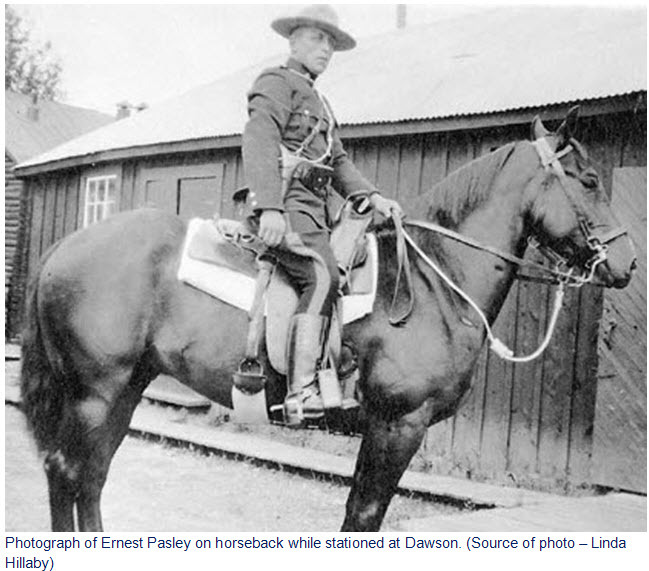 Upon re-engaging in the Force, Ernest Pasley was transferred to Dawson where he was promoted to Corporal on February 5, 1921. In the proceeding five years, he was transferred to Rampart House Detachment (1922), Herschel Island Detachment (1923), Baillie Island Detachment (1924-26) and Edmonton (1927). At Herschel Island Detachment in August 1924, Ernest Pasley caught a ride on a Norwegian supply ship heading in the direction of his next posting – Baillie Island Detachment. On-board, he met a young experienced Norwegian seaman by the name of Henry Larsen. They would become friends and their paths would cross many times in the forthcoming years. 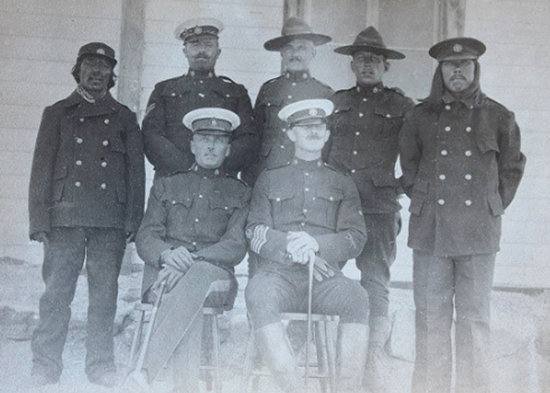 While at Baillie Island Detachment, Ernest was instrumental in saving the lives of 19 Eskimos. In early 1926, Ernest Pasley again met up with Henry Larsen. It was at this meeting that Ernest outlined to Henry that the Force was going to build a schooner of its own. With encouragement from Ernest Pasley, Henry Larsen applied for Canadian citizenship. This new schooner was intended to provide a variety of services in the Western Arctic: serve as a flooding detachment; transporting supplies and members; and other duties as required. 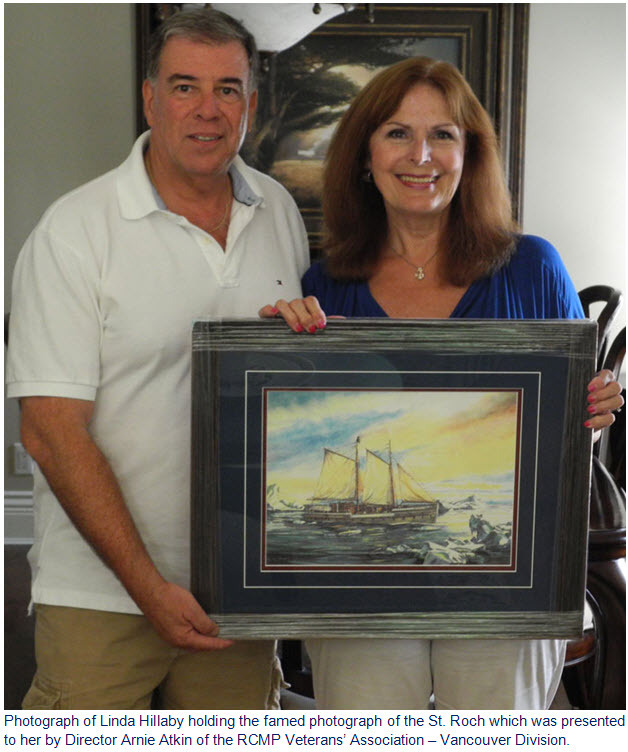 At the time, the Force had no qualified seaman in their ranks to operate this new schooner. In mid 1927, Ernest Pasley was selected to be the skipper for the new Force schooner. As part of this appointment, he was transferred to Vancouver to supervision the construction of the “St. Roch” at the Burrard Dry Docks in North Vancouver, B.C. In his free time to study, Ernest was required to study and be prepared to pass the Naval Master’s exam. On January 11, 1928, Ernest received this designation as a Naval Master. Through late 1927 and early 1928, Ernest continued to promote the skills and abilities of Henry Larsen to Superintendent Arthur William Duffus in Vancouver. In addition Ernest Pasley, the remaining crew members were selected for this maiden voyage: Constables – Henry Larsen, Jack Foster, Fred Sealey, William Parry, Arthur Tudor, Joe Olsen and Terry Pasloe. In late May 1928, the St. Roch was scheduled to take its maiden voyage from North Vancouver to Herschel Island. If the St. Roch was deemed to have met the specifications, the ship would be turned over to the Force at Herschel Island and it was the plan that Corporal Pasley would assume command of the ship. As outlined by Henry Larsen, the St. Roch departed Vancouver on June 28, 1928 and on route to Herschel Island. Under the conditions of the contract to construct the St. Roch, the contractor would provide a Captain to navigate the vessel to Herschel Island and train the crew on how to operate the vessel. Captain Gillen was selected for this maiden voyage. 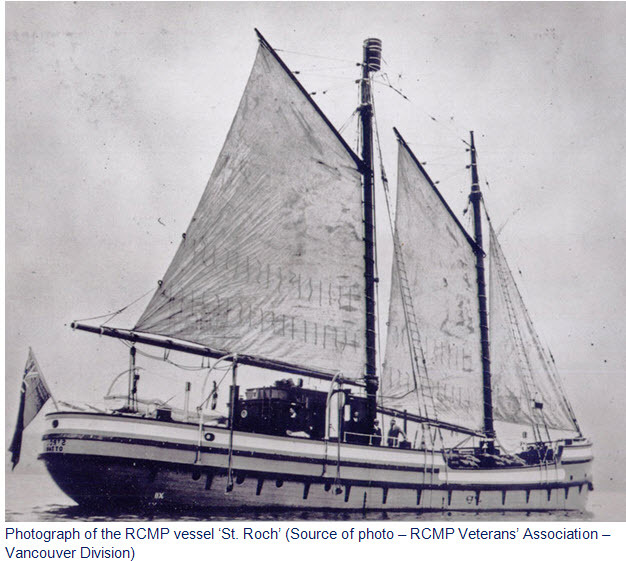 On June 28, 1928, the St. Roch sailed out of Vancouver on route to Herschel Island. A year later, Henry Larsen was promoted to Corporal. On January 28, 1929, Ernest Pasley married Ada Lillian Burnstead. At the time, they were living at 3385 Napier Street in Vancouver, B.C. On September 4, 1931, Ernest secured a position with the Can-Alaska Company and was posted to Cambridge Bay on Victoria Island in the Arctic. His position was the outpost manager and Master of the schooner Nigalik. 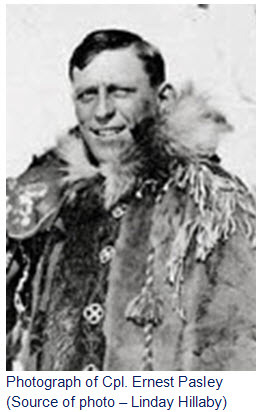 With this position in the Arctic, he came in frequent contact with his old friend Corporal Henry Larsen and members of the RCMP St. Roch. In February 1932 at Cambridge Bay, Ada Pasley gave birth to their daughter June Victoria Pasley. With the nearest doctor over 1,000 miles away and the nearest hospital being over 4,000 miles away, Ernest delivered his daughter and cared for both his wife and their young daughter. 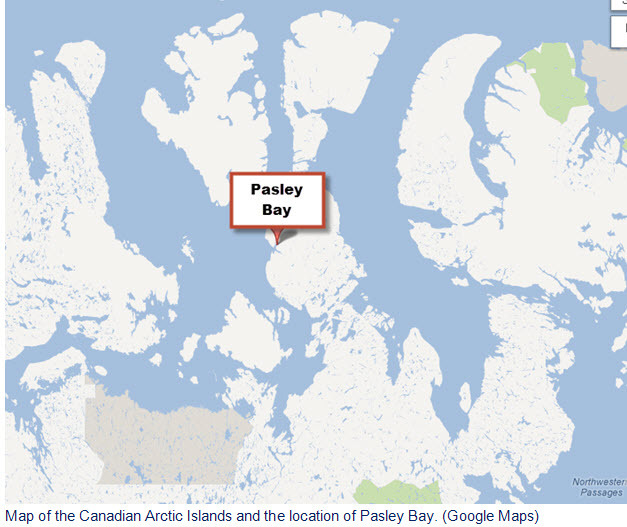 June Pasley is credited as being the first white person to be born within the Canadian Arctic. Despite the 6 months of darkness and isolation, June Pasley received the total devotion from both her parents. In 1938, Ernest Pasley retired from his position with the Can-Alaska Trading Company and moved his family from Cambridge Bay to Vancouver, B.C. In the following year, he returned to England with his wife and daughter then returned to Vancouver. On January 20, 1943, Ernest passed away from “Cerebral Thrombosis-Myocarditis Bronchopneumonia” in the Shaughnessy Military Hospital in Vancouver. He was only 54 years of age. Ernest was laid to rest in the military section of the Mountain View cemetery in Vancouver. A photograph of his grave marker is pictured below. Despite having served in the Force, there was no reference on his grave marker that he had served in the Force. 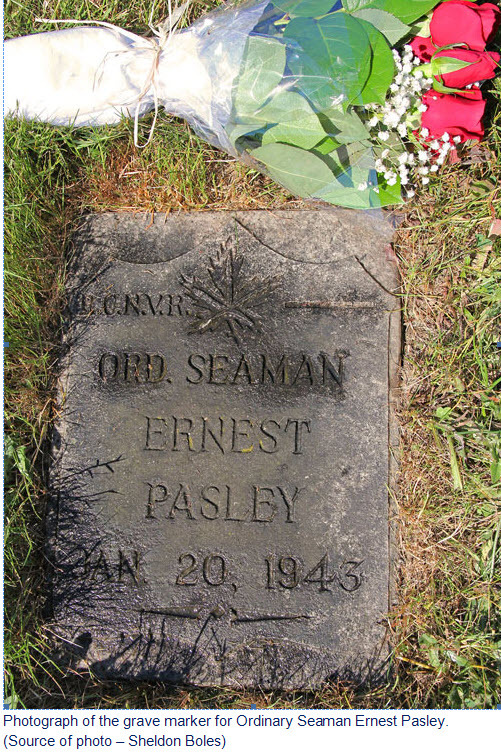 Beneath this simple grave marker, Ernest Pasley lays at rest. A man who made his contributions to the Force and to our nation. 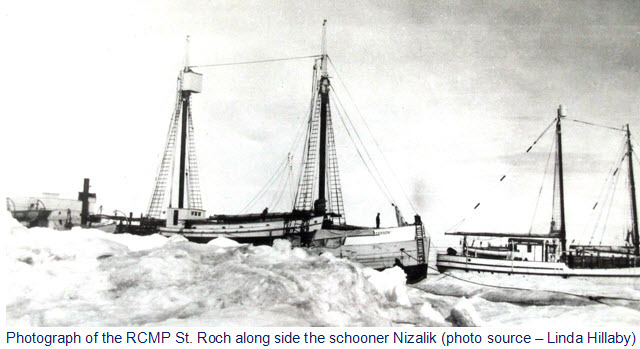 It is interesting to note that on first navigation of the Northwest Passage (west to east), the St. Roch was forced by the ice to lay up for the winter in Pasley Bay on September 25, 1940. Then on February 13, 1942 Constable Albert Chartrand suddenly died from a heart attack. He was buried nearby under bounders and a large wooden cross. It is believed that Pasley Bay was named after Ernest Pasley. However at the time of the development of this tribute article, we were unable to confirm this assumption. 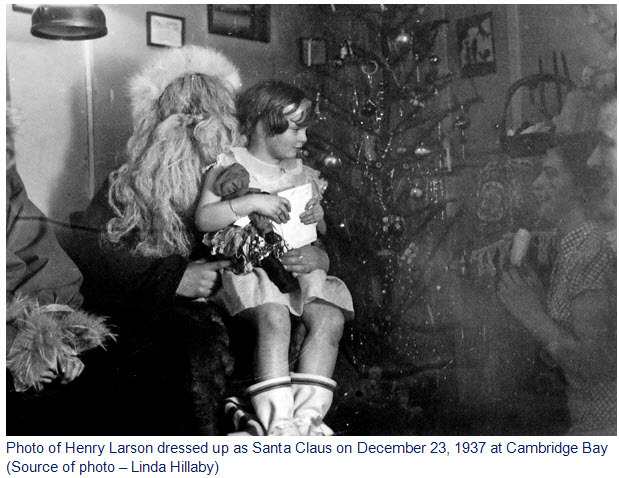 The details of the Baker Lake and the little known relationship between Ernest Pasley and Henry Larsen would have gone untold if the details had not been brought to our attention by Linda Hillaby – granddaughter of Ernest Pasley. In addition, Linda volunteered to assist in helping with the RCMP Veterans’ Association’s 2012 Annual General Meeting (AGM) in Vancouver, B.C. As such, it was decided to present Linda Hillaby with a special gift from the RCMP Veterans’ Association – Vancouver Division – a framed image of the St. Roch which her grandfather was so closely associated. “Report of the Royal Northwest Mounted Police 1914” – page 23. Morrison, William – “Showing The Flag: The Mounted Police And Canadian Sovereignty In The North 1894-1925” by William R. Morrison – University of British Columbia Press, 1985 – page 136. “Report of the Royal Northwest Mounted Police 1915” – page 265. “Report of the Royal Northwest Mounted Police 1915 – page 274. “Report of the Royal Canadian Mounted Police for the Year Ended September 30, 1926,” F.A. Acland – page 76.